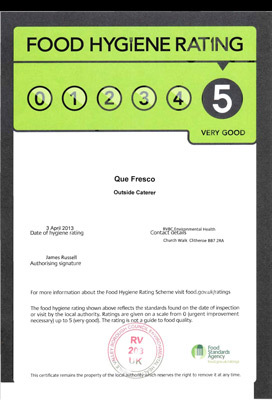 Hog Roast & BBQ catering Lancashire, welcome to Que Fresco! Our philosophy is simple…authentic charcoal cooking using the finest Lancashire produce wherever possible. 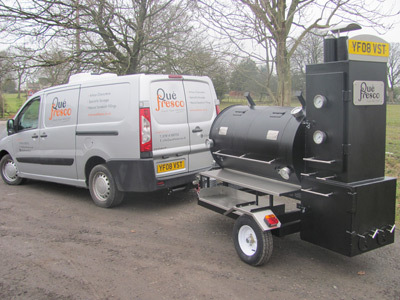 Click here for Hog Roast, read on for BBQ catering. "We’ve used Que Fresco barbecue catering for a number of hospitality events and without fail our clients always rave about the food." Collectively we have years of experience catering for weddings, corporate events and private parties and all of it in outdoor BBQ catering…if it’s not cooked over charcoal, we don’t do it. There are other things that we are passionate about too…fresh produce. Whether your event is big or small, corporate event, village hog roast or children’s party, we are here to help. We can provide a full event service with marquee hire, licensed bar, tables, chairs etc or simply rock up and serve our smoky BBQ food. 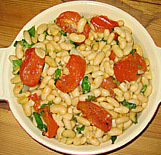 All our produce is either home-made or sourced from the finest local producers, we are also experts in catering for special dietary needs such as gluten intolerance. We have a multitude of menu options suit every budget and even if you just want a sausage and burger barbecue then relax, we make our own sausage, we make our own burgers and we’ll be delighted to tell you what’s in them (or more importantly what chemicals and other additives are NOT in them). "Hi Paul, What a fabulous day, every single person had a great time. The food was fabulous and you and your team were fantastic! Thank you so much for making it a very memorable garden party." 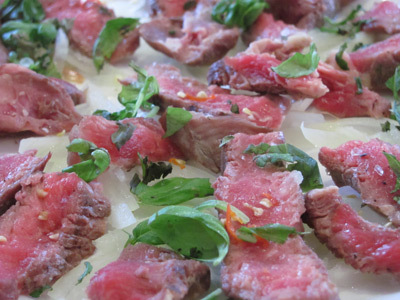 BBQ catering Lancashire and beyond just for you! We clear up and leave your venue exactly as we found it…and we take our rubbish with us! A Que Fresco BBQ catering Lancashire menu is designed to give you variety, fresh local produce and also to meet your proposed budget. Some examples are below and we can flex to meet most budgets. Add £5.95 per head and every guest can have a mini cheeseboard containing fresh organic Pextenement Cheese (Contains 3 miniature (5cm) cheeses (Pexommier, East Lee, Garlic East Lee), along with a portion of Heritage Kitchen Chilli Jam, pickled onions and 2 packs of Jacobs Crackers. If you’re planning a BBQ event then please call Paul on 07814 500755 or complete the rapid response form below so we can hold availability for your chosen date. Sweet sticky glazed ribs – baby back ribs rubbed in Que Fresco dust, cooked low and slow and served in our sweet stick barbecue sauce. "Best ribs I've had in the UK. 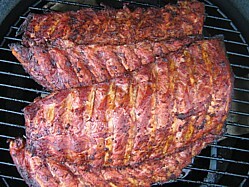 The spice in the rub, the sweetness in the sauce and the smokiness in the rib work together perfectly!" Service can be presented to your guests on a communal table for a self-service “graze” or in smaller portions to be delivered to table for guests to share. Don’t ask for individual service…we don't think that it suits the informal nature of a barbecue so we don't offer it. "Que Fresco supported our “Night of 100 Wines” with their delicious pulled pork and piri piri chicken. Everyone left happy, especially those with special dietary needs"
Our hog roast team in Lancashire is led by our star chef Anthony. "Dear Paul, Just wanted to say how much we enjoyed the food on Sunday. It all tasted delicious and there were numerous compliments flying around about how good it was. Anthony was both efficient and pleasant and we had a fantastic day. A big thank you to Que Fresco for helping to make it." We use the finest rare bread pigs for our "Lancashire Hog Roasts" but hardly Lancastrian... the "Gloucestershire Old Spot" is simply the best when it comes to roasting the whole pig. The perfectly balanced fat distribution will delight your guests with succulent slices of pork and light rosemary salted crispy crackling. 70kg Spit roasted "Gloucestershire Old Spot Pig"
In addition to the hog roast menu above this option delivers both an appetizer and dessert all in one bundle. This price is based on a minimum of 60 guests. 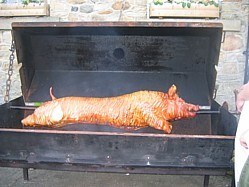 Chef Anthony to cook, carve and serve your hog roast. Plates and cutlery can be upgraded to our ceramic plates and stainless steel cutlery for an extra £1 per person. BBQ Catering Lancashire And Beyond! 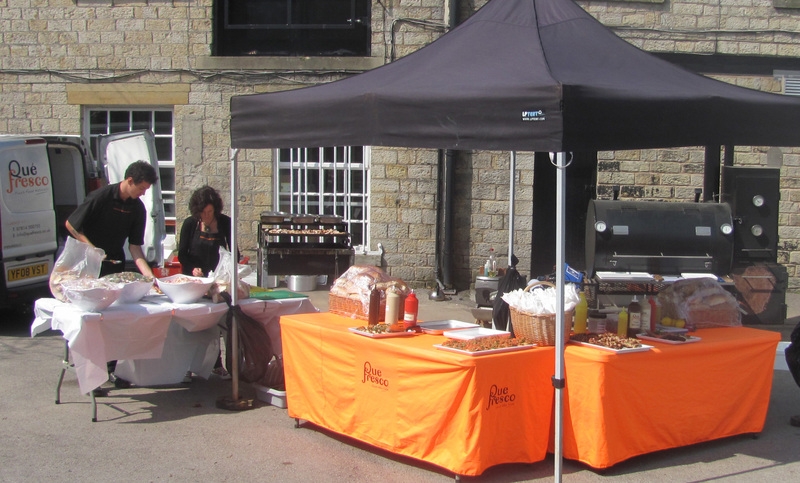 Having started with BBQ catering Lancashire our reputation has gone from strength to strength in the county. We now have the capability to offer a full outdoor BBQ catering UK service with an even more varied menu and a special low cost wedding BBQ catering service. 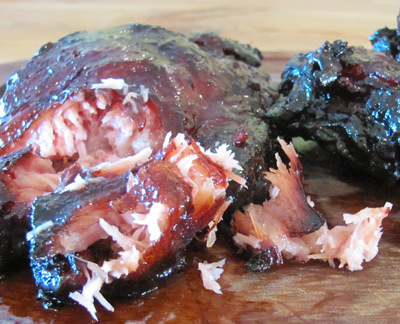 All Hog Roast & BBQ catering Lancashire bookings must be secured by a 50% non-refundable deposit. This must be paid within 1 month of receiving a quote for the booking, with the remaining balance payable 2 weeks before the day of the event. four weeks before the function. responsibility of the client to ensure the numbers are met. We will be flexible where possible and where proposed numbers are not met there will be a minimum charge of 75% of the original quotation. Parking space and road access to the catering area must be available. All parking permits/fees are to be met by the client. For that unique bbq catering Lancashire atmosphere, call Paul on 07814 500755 or complete the rapid response form below.